Slim sophisticated chrome picture light that will add a touch of contemporary elegance to your home. The gleaming chrome finish reflects light from its surroundings to add warmth and depth to any interior wall, while the enclosed LED strip beautifully enhances your artwork with subtle downlighting. The petite design of this lovely product means that it will fit in a variety of areas, no matter how small. 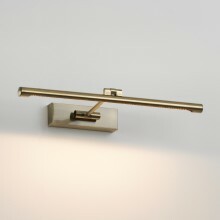 It could therefore serve as a wall light rather than a picture light in some situations. The product features an integral LED driver and ready for immediate installation.